The CRE Consulting Corps provides real estate analysis and action plans for municipalities, not-for-profit organizations, government entities, educational institutions, and other nonprofit owners of real property. Is your organization planning for the right real estate opportunities for the right reasons? Does your organization have a strategic plan for its real estate assets? Does your organization have a real estate action plan to guide development initiatives? Has your organization’s real estate plan been evaluated by an unbiased, objective panel of real estate professionals? Is your organization leveraging its real property assets to meet the goals of the organization or community? Is your organization maximizing the performance and returns on investment of its real estate assets? 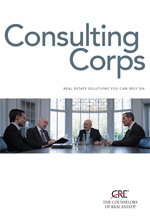 Click here to download a PDF of the CRE Consulting Corps Brochure.